This past fall I had the privilege to direct a very unique and powerful play, perhaps one of the most universally moving pieces in American theatre today. A Civil War Christmas: An American Musical Celebration is Pulitzer Prize-winning playwright Paula Vogel’s first venture into the musical genre, and it is a real winner. I’ve talked before about how important this piece is, so I won’t get into that again. The show has come and gone–swiftly as sand through the fingers–and life since has moved on far too quickly. But the effect that the show had on all of our lives– those of us in the cast, in the church, and in the community– will be lasting and cannot be undone. 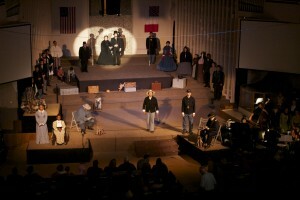 Our short 3-performance run turned out around 1,400 people in all, packing the house out at around 600 the last night. I proudly had to give up my seat in the upper balcony that night. The cast, made up of church members, members of our sister church True Vine, and a few random community members I met through Downey Arts Coalition, many of whom have never been in a play before, turned out surprising and powerful performances, which left raw emotions, and newly realized familiar old music lingering in the mind. The long process was a journey of journeys. We hit the ground running after a long and stressful casting period. It is not easy to cast a play with 80 characters spread out over 27 cast members, navigating scene overlaps, actor schedules, and costume changes. We didn’t receive either the rights to the play or the music until nearly halfway through the process (thanks Dramatist Play Service!! ), and bearing the heavy weight of responsibility for such an important production proved to be a heavy burden on my mind and my family. Yet nonetheless, by the grace of God, a lot of faith, and the patient, steadfast support of those whose shared this vision, we saw this thing through until the glorious end. And it was worth everything. To explain some of the pictures here, the visual look of the opening went through many phases. I finally settled on the above configuration in the eleventh hour. This is a good example of how the staging of this play was more complicated than I expected, with things happening all over the stage simultaneously, spanning different times and spaces, inter-cutting like a movie. So glad we had all the levels and staging areas that the FBCD sanctuary had to offer. Just want to point out a few very memorable performances. Newcomer Rafaela Ramirez turned out a heartfelt and moving performance as Aggie, the mother of Elizabeth Keckley in a flashback scene. Ramirez portrayed many characters and all her performances were solid as a rock. I was thrilled to direct our Pastor of Worship Arts and my dear friend, David Stanton (pictured above), as the abolitionist Quaker union soldier, Chester Manton Saunders. Working alongside him was another newcomer, Manual Garay, who brought a devastatingly delicate strength to the brooding Decatur Bronson, a black union soldier who carries a heavy burden of both rage and sorrow. Senior Pastor Steve Shangraw demonstrated once again his range and depth with the vast array of characters and songs he performed. Even the smallest role was fully realized both internally and physically. I told him if this whole pastor thing doesn’t pan out, he could always fall back on a career in the theatre. 😉 And lastly, youngster Daniel Frometa had great range and depth in his many roles, spanning from a wounded soldier who predicts the Lincoln assassination, to a young confederate willing to shed every drop of blood for his country. We had some great publicity, thanks largely to an incredible postcard designed by Andrew. We are also very grateful to The Downey Patriot for covering our play twice before the opening, and printing a review after. The church submitted a brief informative article that appeared in the Community section, and DAC member Marisa Urutia Gedney wrote a great piece after an interview with me that was prominently placed in the paper and I think brought a lot of attention to our upcoming production. Then after the show, Patriot contributor and DAC member Carol Kearns was so moved by the performance that she penned a glowing review. Life for me personally got very stressful during the last few weeks of rehearsal. The last few weeks of rehearsal are always very stressful, of course, but around Thanksgiving I was called in to substitute at Cerritos College again, teaching Fundamentals of Acting twice a week for a 4.5-hour class. I was so pleased to take the job, but the timing was a perfect storm. Using a babysitter is hard enough for me, but the fact that our family was spread out between Fullerton, Brea (the kids), Santa Monica (Andrew), and Norwalk (me), and then having to collect the kids and rush back to Downey for rehearsal at night, made life pretty tough. I generally hate fast food, but I confess it was a necessity during that time! We all got sick afterward, the kids became very clingy and needy, all of which just made me feel incredibly guilty. It was a relief afterward to be able to throw myself headfirst back into mothering full time after finals and the show closing. Yet through all this, I have no regrets and still count even the hardest moments as a blessing for our whole family. Everyone had fun, and doing theatre together as a family (whatever that looks like) has always been a dream of Andrew’s and mine. I had the thought one night during all this, when I realized that I spend a couple of days per week right now warming up actors, critiquing scenes, and giving acting tips, I thought, “Wow, I’m doing it. I’m a real theatre professional. This is what I’m doing with my life.” Sure it’s not perfect. It’s at a church, my actors are amateurs, it’s “just Downey”… but on the other hand, by night I’m directing a new Paula Vogel play (!! ), in a great space, with a very talented and dedicated cast, who will perform in front of a HUGE crowd, and by day I’m teaching college. It is not what I expected of my career when I began it 10 years ago, but it’s pretty great. I’m one lucky kid. In addition, I was so proud that our five-year-old had his theatrical debut in this show. We really didn’t know if this would work out for him, because he is such a free spirit and isn’t that great at following directions, lol. =) But as the opening grew near, he became more and more eager to do it. The first night (dress rehearsal) a couple unexpected things happened for him and he ended up running around the stage looking for a spot to go to. I paired him up with a big kid the next night and all was well. I really think he is a performer at heart, so it was great to give him this inaugural opportunity. It was thrilling to see him get nervous, develop a plan with him, see him face his fears, and come out the other end feeling accomplished, excited, and relieved. 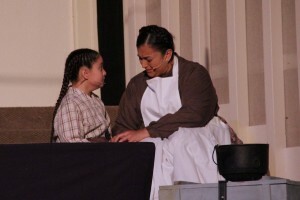 I’m so grateful to FBCD for believing in this play. It had a very powerful impact on so many people. I’m very thankful to all who supported the cast and crew in this effort. I’m thankful to all the community members who supported the production in a variety of ways, even just to come to the show. We really did something special in Downey that will have a lasting impact. 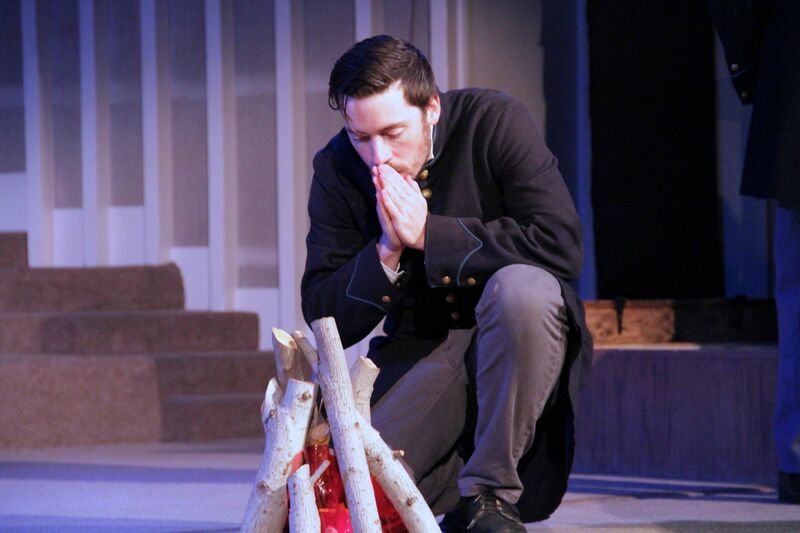 We at the DAC have more ideas and plans for theatre in Downey, but none so huge as A Civil War Christmas. It will most certainly be the last of its kind for a while. But the future looks bright, and I am eager about what lies ahead. Thank you for this wonderful retrospective! It was indeed a powerful and ambitious play. You did an amazing job directing and giving it your full vision. Wow! What an ensemble! 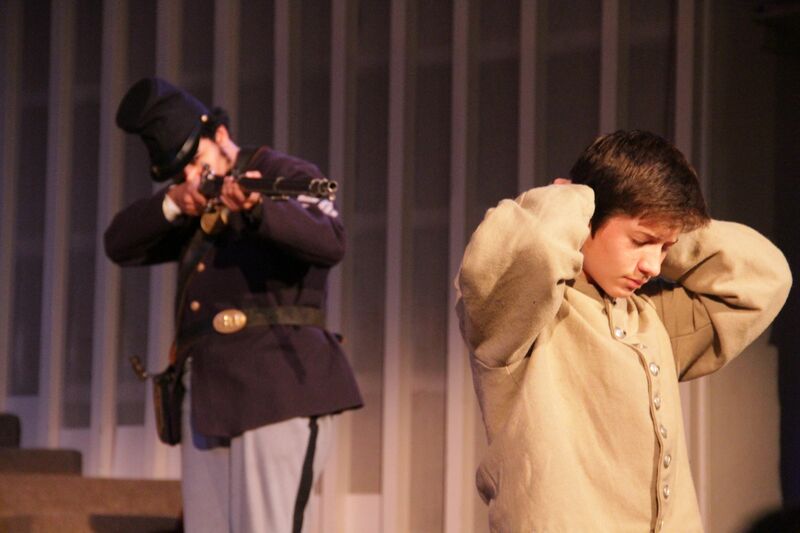 Everyone’s passion, dedication and commitment to the play was evident in those 3 performances. 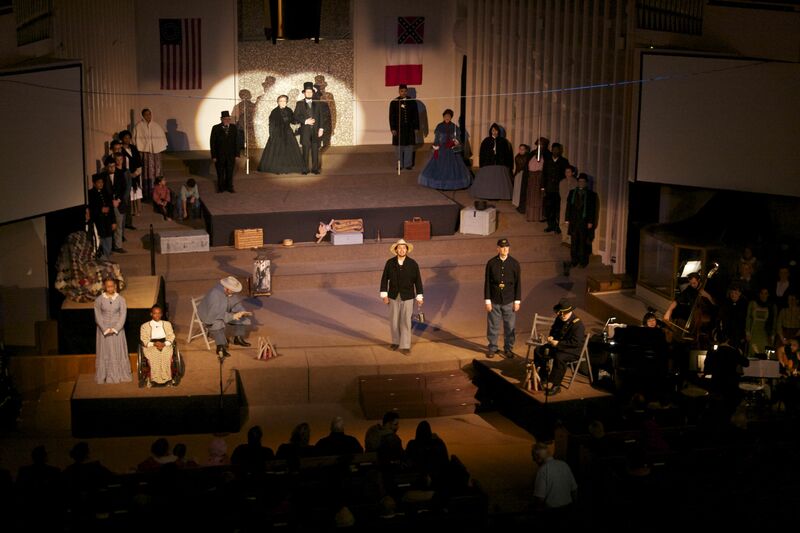 I am very proud of you, our FBCD family & all those that were involved with bringing this play to life. It was indeed a huge blessing to our community and had an impact on the lives of many, perhaps many more we will not now. I pray you continue to use your amazing God-given talents and continue to lead our future Christmas plays. You have a great family and we are so very blessed to know you!